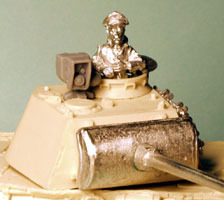 West Wind is producing a whole range of WW2 28 mm Miniature Figures. Their 1st range of figures started in Feb. 2000 and has now grown steadily to over 90 packs and over 20 Vehicles. 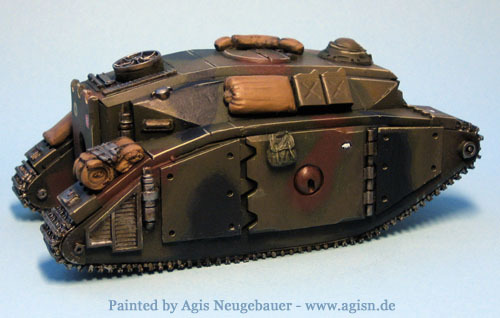 A good example of their range is the PzKpfw IV H with Side Plates (Schürzen) below. 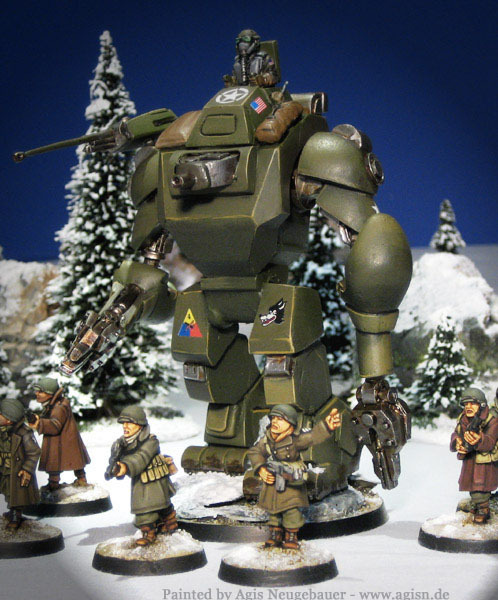 The Infantryman is from Artizan just to prove that the ranges work well together. 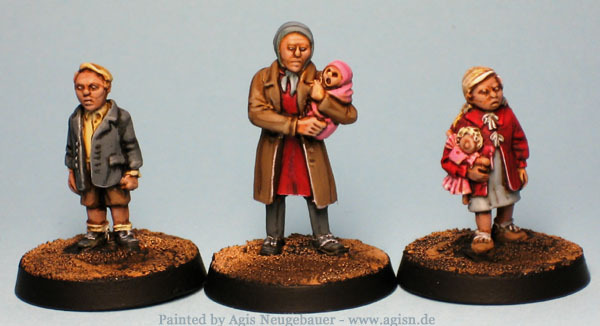 Their newest range is the Pulp style alternate history “Secrets of the 3rd Reich” line. 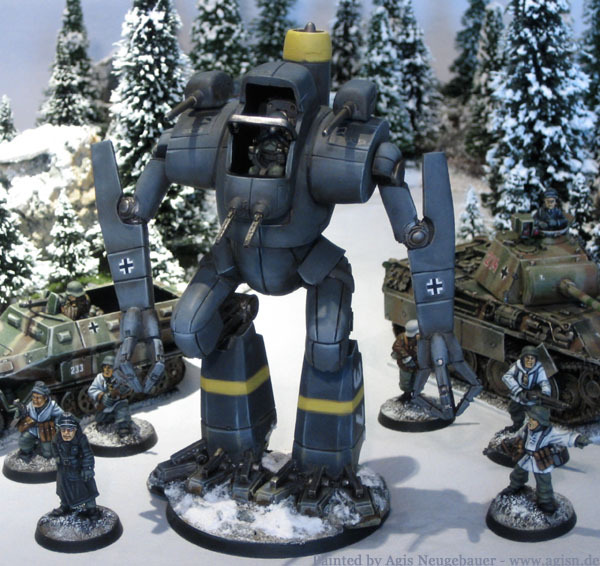 The September 2006 release consists of 2 British vehicles, the Battlemaster APC and Recon; 1 American M203 walker and 1 German Panzer Mecha walker. I liked the line right from the start and immediately painted the APC and Recon vehicles. West Wind was kind enough to provide me some preview samples of the upcoming infantry ranges. First painted are the German Troopers above. The M203 “Sarge” Mecha to the right is also a fantastic kit. 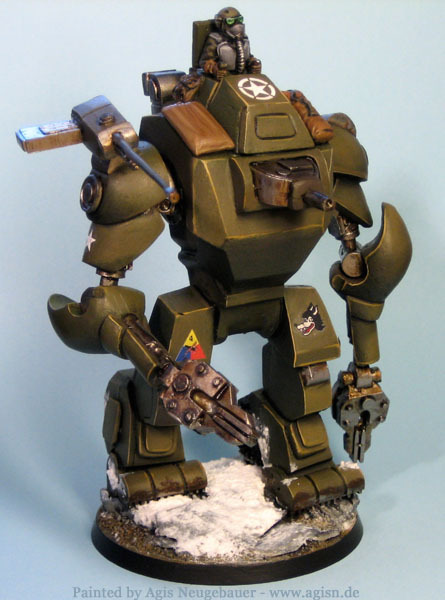 You get a huge piece of resin and a real lot of metal parts create this beast. 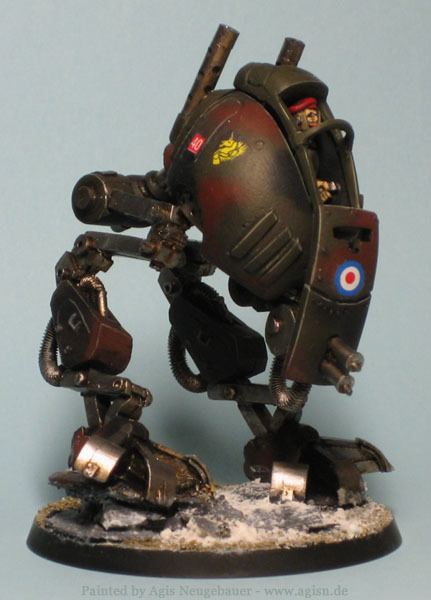 After the failure of Montgomerys Operation Kallisto, the RAF felt there was a need for a light mecha to support air dropped forces. Designed with a light weight airframe concept, the RAT could be brought in by glider. 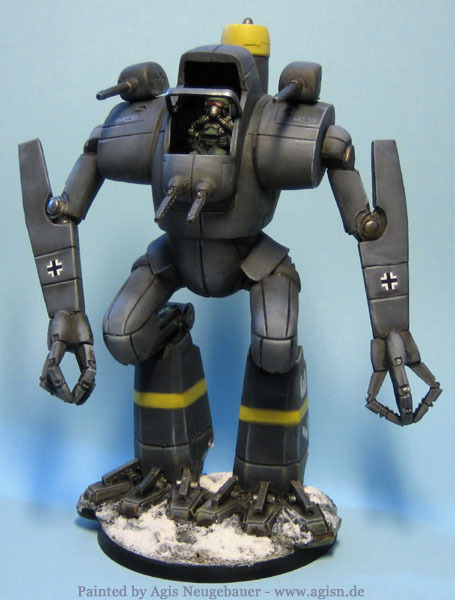 The RAT was developed using technology from captured German PanzerMecha. It was built by the de Havilland Aircraft Company and entered service in late 1944. although only lightly armoured the RAT was a tough little beast easily serviced in the field. Conceived to be flexible and capable of many tasks the RAT family of Mecha grew to include many variants. The Me 323 Jet Mecha is soon to be released by West Wind. Another fantastic design that fused WW2 designs (here the He 162 Volksjaeger backpack Jet engine) with a “What If” mecha design. I just love these kits. 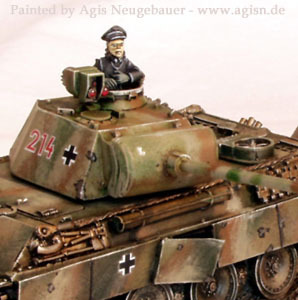 The Infantry minis are Artizan 28 mm late War Germans. 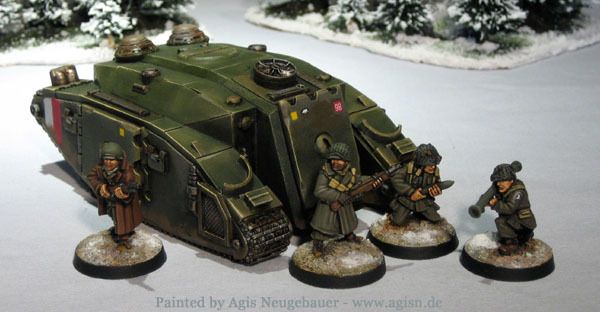 Above - Battle Master Recon; below Battle Master APC. Minis are late war Artizan Americans for scale purpose. 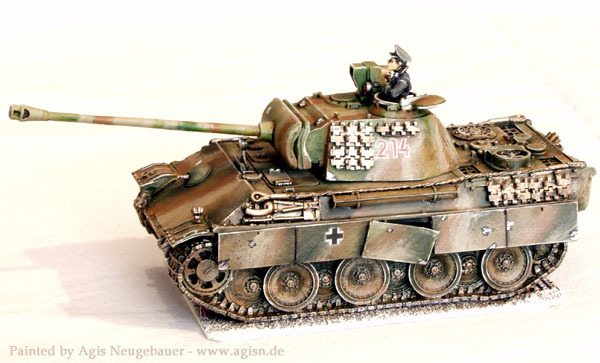 The also make a very nice Panther G and Jagdpanther. These are resin hull models with all the rest metal parts. 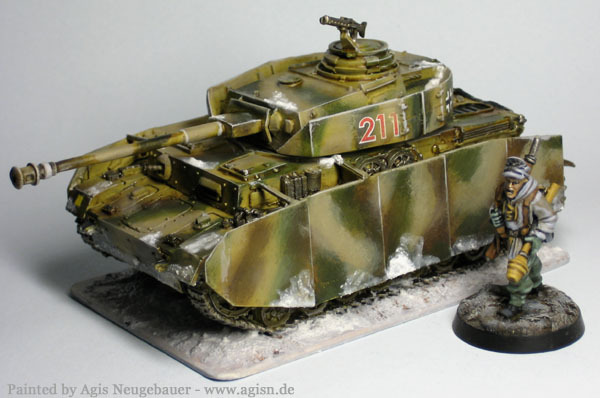 A great opportunity to customise your model (see the track guards on my model). I mounted the kit on a plasticard base. 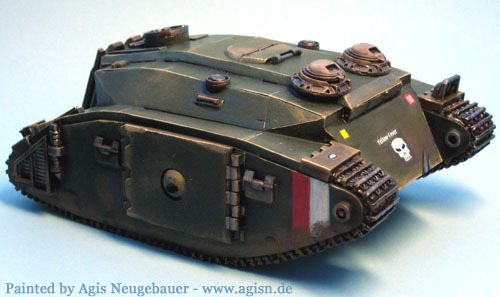 Since my whole late war army is build around the late war Ardennes campaign, I decided that my Panther should be equipped with the Sperber/FG 1250 Infrarotsichtgeraet. In 1936, AEG was ordered to start the development of infrared night-vision devices and in 1939, first successful prototype unit for use with 37 mm Pak 35/36 L/45 anti-tank gun was constructed. In autumn of 1942, unit for use (infrared headlamp with viewer ZG 1221) with 75 mm PaK 40 L/46 anti-tank gun was constructed and was also mounted on Marder II (Sd.Kfz.131). In mid 1943, first tests with infrared night-vision (Nacht Jaeger) devices and telescopic rangefinders mounted on Panther started. 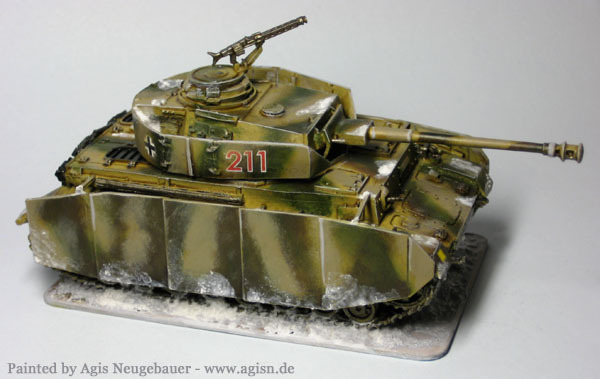 Two different arrangements / solutions were created and used on Panther tanks. The Sperber (Sparrow Hawk) - FG 1250 was made up of one 30 cm infrared searchlight (with range of 600m) and image converter operated by the commander. From late 1944 to March of 1945, some Panzerkampfwagen V Panther Ausf G (and other variants) mounted with FG 1250, were successfully tested. 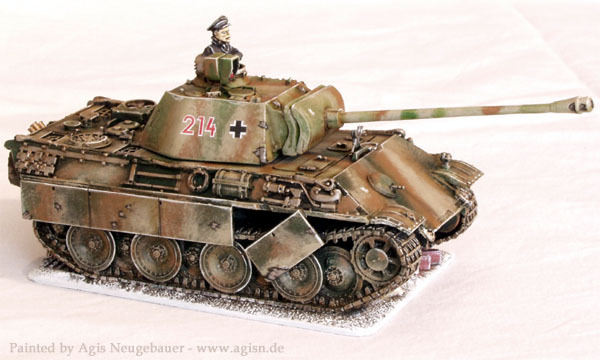 From March to April of 1945, approximately 50 Panthers Ausf G (and other variants) mounted with FG 1250, saw combat service on the Eastern Front and Western Front. The Sperber/FG 1250 on my kit is scratch build by using some GW tank parts.